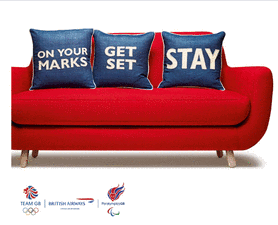 British Airways is launching a marketing campaign urging Britons to stay at home during the Olympics, saying on their Facebook page: “Don’t Fly. Support Team GB” with an advert during the Euro 2012 match between UK and Ukraine that is expected to be watched by millions. Presumably their aim is to get people to go to the Olympics. What they should be saying, but probably aren’t, is that Britons could be supporting UK Plc, by holidaying at home, rather than taking their money abroad – which BA and the other airlines so effectively facilitate. But it is unlikely that BA are being that honest …. They are only asking Brits to delay their travel, not forego it. Launching at 11:00hrs exclusively on Facebook, http://www.facebook.com/homeadvantage the advert will tell Britons: “Don’t Fly. Support Team GB”. It will be followed by a TV commercial during tonight’s Euro 2012 match between England and Ukraine that is expected to be watched by millions. BA described the ad as “tongue in cheek” but it seemed likely to cause a further headache for outbound operators who were infuriated earlier this year by a government campaign to persuade Britons to holiday in the UK this summer. However, ABTA did not appear antagonised by the BA advert that could potentially dissuade holidaymakers from travelling during the summer peak. An ABTA spokesman said: “Everybody in the industry is fully behind team GB at both the Olympics and Paralympics. The incredible domestic demand for Olympics tickets has shown that there is very little danger of our athletes lacking home support. Details of the BA ad have been kept under wraps until this morning’s launch, but it features a BA plane taxiing off the runway, out of the airport and through London to the Olympic Park to the soundtrack of London Calling by The Clash. As the aircraft arrives at the Park, it features the tagline “Don’t Fly. Support Team GB and Paralympics GB”.